While trying to get their hands on a free LG G2 coupon, 20 people got injured in a public park in northern Seoul. LG decided to cancel the other similar events already scheduled. Only a few days after the official release of the LG G2, the South Korean manufacturer LG has been forced to change its domestic marketing strategy due to a public relations event that went wrong. 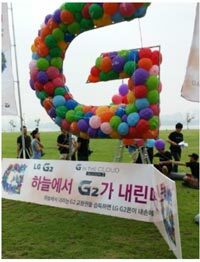 During this event, dubbed "G in the Cloud" and taking place in Seoul, LG was supposed to release helium balloons in the air. One hundred of these balloons had free LG G2 coupons attached and people were supposed to retrieve the balloons after their release. Unfortunately, they used BB guns to take them down and, even worse, a woman was seen carrying a long spear or something similar. As a result, about 20 people were injured and 7 were hospitalized, although it is not clear yet what caused the injuries. All the similar events were canceled, including the one expected to take place in Busan. More than just canceling similar events "due to safety concerns", LG has also promised to compensate those who were injured this last Friday, assuming full responsibility for the failure of its outdoor event. In the US, the LG G2 was seen for the first time last week, at a press event in New York City (please see the link in the first paragraph for details). There, the smartphone will be carried by Verizon, AT&T, Sprint, and T-Mobile.